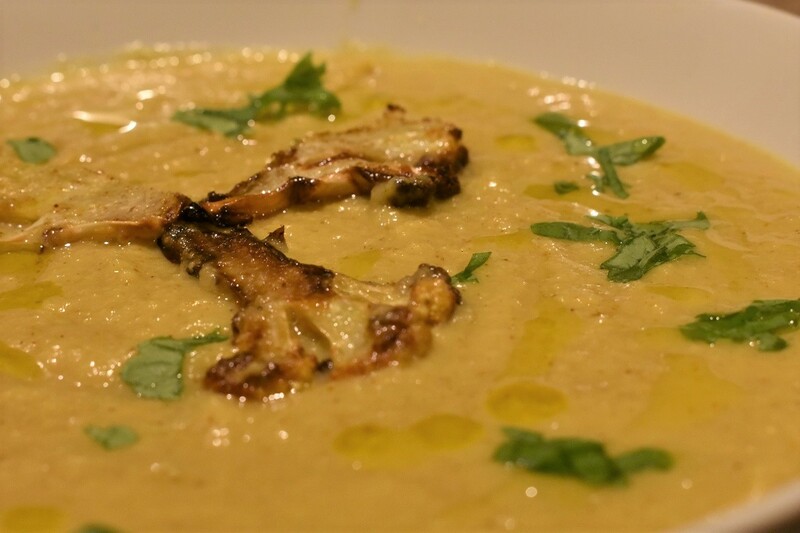 This is a hearty spiced cauliflower soup that is easy and costs very little to make. I often make at least double the quantities and freeze some for a later time – although all too often even a larger amount of soup gets polished off in one sitting! Cauliflower is one of my favourite vegetables – and frustratingly one of the hardest for me to grow! – and it makes THE most wonderfully satisfying soup. Had there been an Ultimate Soup Challenge during Britain’s Best Home Cook, this soup would have been my first choice to make. 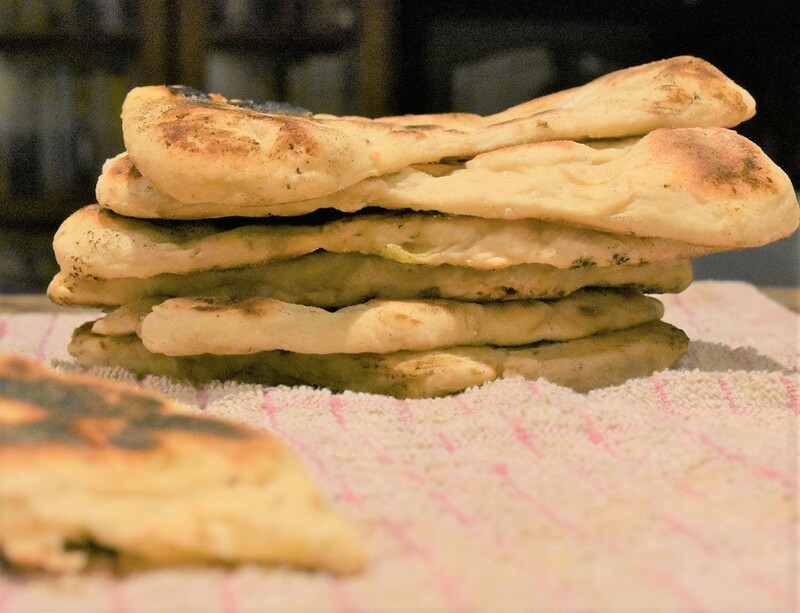 I love to serve this with flatbreads, and my cumin and onion flatbreads always go down well: their gutsy flavour easily matches that of the soup. 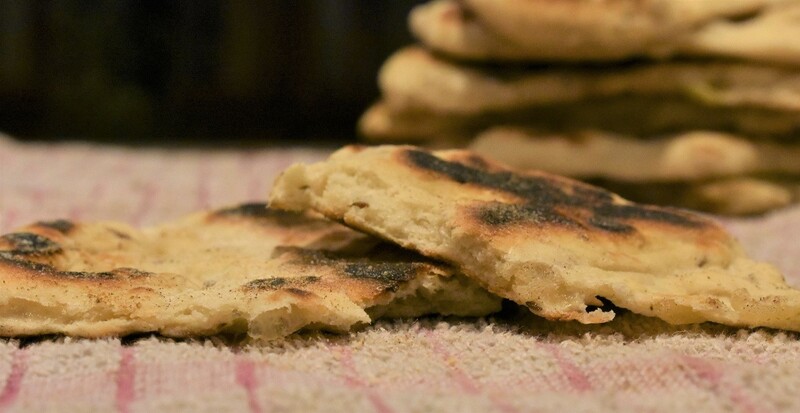 The recipe for these flatbreads is below the cauliflower recipe. However, I wouldn’t turn my nose up at good shop-bought breads to dunk into this soup! I have used the cauliflower in a couple of ways here, each of which brings something different to the table. 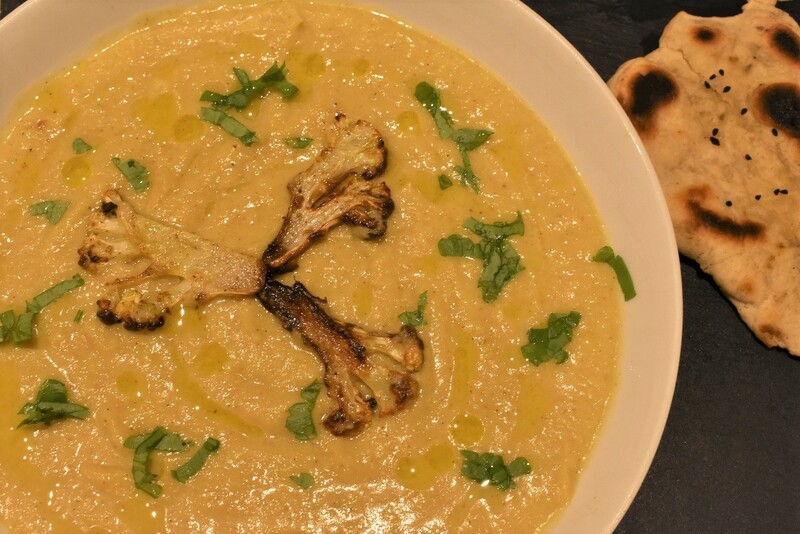 Some of the florets gets roasted until it gets toasted around the edges – my favourite way to cook and eat cauliflower – and most the rest gets simmered in the spiced stock. 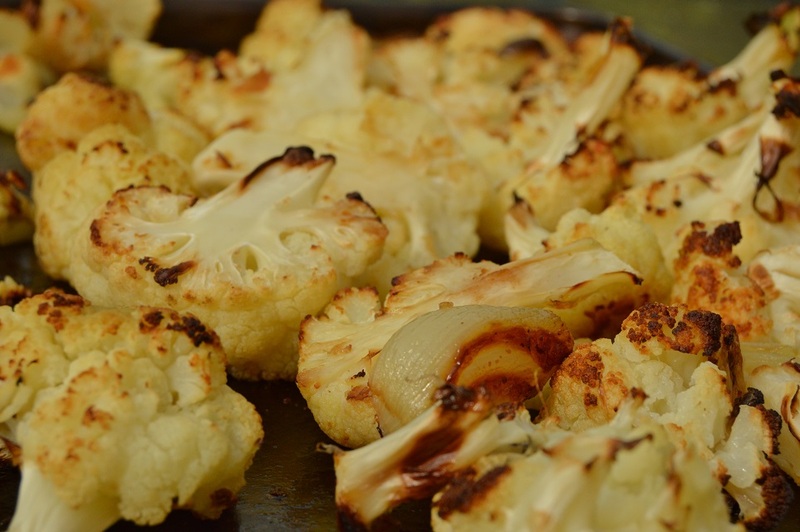 I almost always roast cauliflower in dishes, as it gives is a terrific depth of flavour: sometimes I roast it with spices or with other vegetables, but often I just roast it with oil in a large batch. 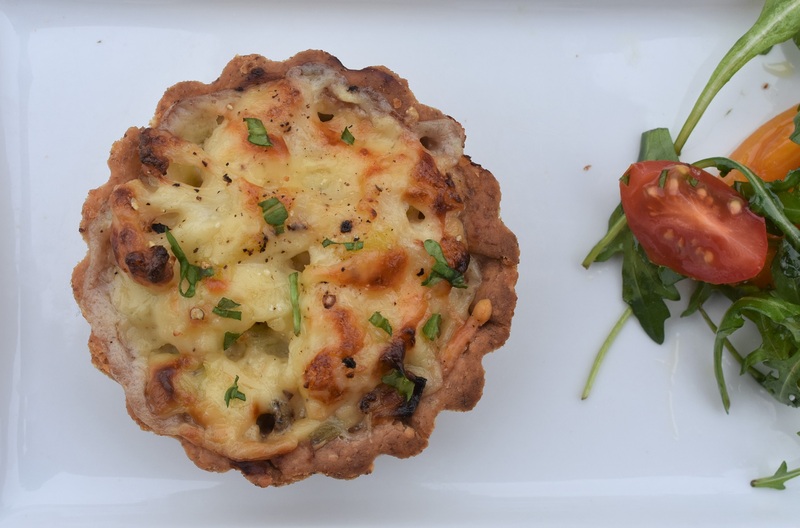 My roasted cauliflower cheese that I made as a side dish to my Ultimate Roast during Episode 4 of Britain’s Best Home Cook went down a storm with all the judges, and people who have made it with roasted cauliflower swear they will not go back to the steamed/boiled cauliflower! With cauliflower, I also take a couple of florets and slice them thinly, brush with oil and dust lightly with garam masala and then pop them on a sheet of greaseproof and pop in the oven (at about 180C) for 15-20 minutes until they also go golden-brown and have softened. These are excellent popped on top of the soup just before serving. More of my cauliflower recipes can be found at the bottom of the page. I usually dry-roast and then grind my favourite combination of spices for this soup: cumin seeds, coriander seeds, fenugreek seeds and cardamom, as well as a little fresh chilli. However, a good curry paste or curry powder does the trick. I sometimes add chopped chilli, but normally with this soup I opt for the warmth and flavour of the spices than the chilli heat. I love curry oil and I often make my own in small batches. This is simply vegetable oil heated gently with curry powder for about 30 minutes, before being strained. I vary between using a good curry powder or freshly-ground dry-roasted spices – similar to those in the recipe below. I tend to go for about 1 teaspoon curry powder/ground spices per 100ml oil. (1) Mix about half of the cauliflower with some of the oil and the salt and put into a large baking dish or tray. Place in an oven pre-heated to about 180C (fan) for about 40 minutes, or until the cauliflower takes on a deep golden tinge: if some of it goes too dark, that is absolutely fine. (2) Heat a little of the oil in a large pan – frying pan or deep casserole dish – and add the garlic and onions. Cook gently for about 5 minutes until just starting to colour lightly. (3) Add the curry powder (or the ground spices) and cook for a further 5-10 minutes over a very low heat, taking care not to burn the spices. You can also add some chopped fresh chilli if you prefer. (4) Add the rest of the uncooked cauliflower and stir well to coat it with the onion and spice mixture. Add the milk and the stock and bring to a gentle simmer. Place a lid on and let the mixture simmer for abour 30 minutes. (5) Add the roasted cauliflower and continue to simmer gently for about 10 more minutes or until all the cauliflower is very tender, stirring in the garam masala in the last few minutes or so. (6) Blitz well and serve. I like to sprinkle over fresh coriander, extra roasted cauliflower slices and a few drops of curry oil. (1) Put the ingredients into a bowl and bring together to give a fairly firm dough, adding more yoghurt, or even water, if needed. Knead for 5-10 minutes until smooth: you can do all this in a food mixer with the dough hook attachment. NB: I go for a firmer dough here than for most breads I make, a softer dough will be fine: but if too soft, it will be harder to roll out. 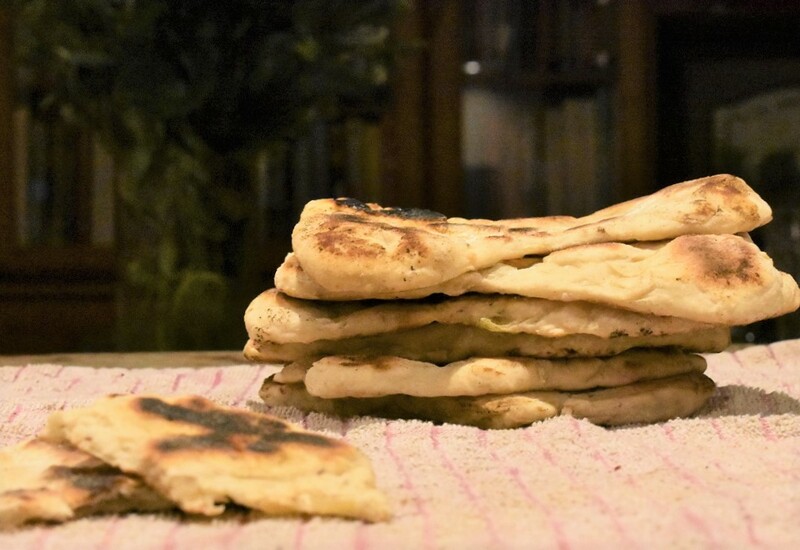 (2) Cover with clingflim and leave at room temperature until about doubled in size, or leave it in the fridge to prove slowly (which gives a better flavour): just go for whatever is convenient. 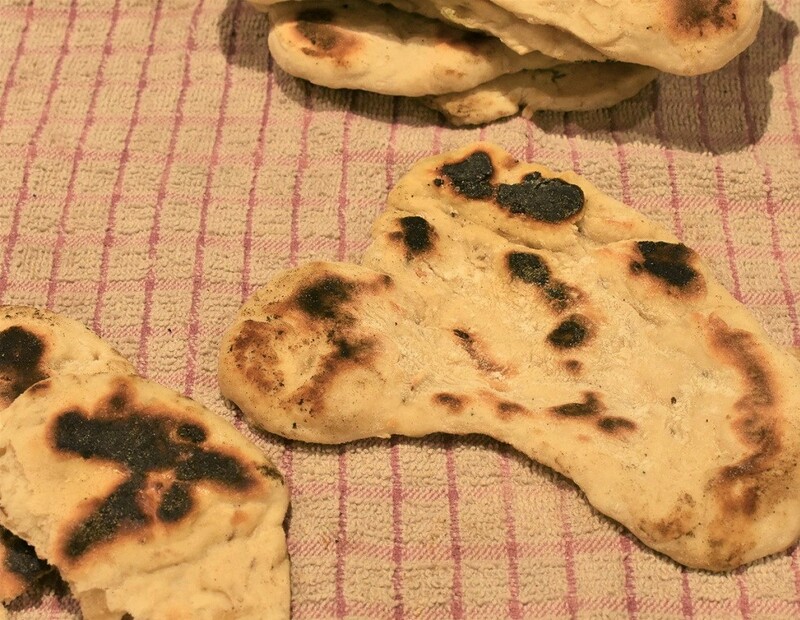 (3) Take small balls of dough, and roll out on a floured surface to a rough oval shape – or any shape to be honest! Place in a hot dry frying pan and cook for a few minutes on either side. You should get nice black blisters all over the bread. NB: you could also brush the bread with a little melted butter so it goes shiny and soft on the outside, and sprinkle with onion seeds. I will try this recipe soon! 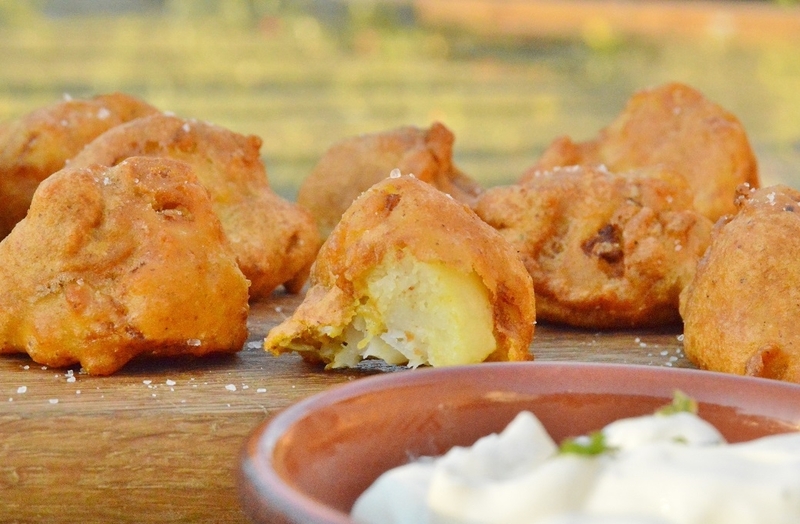 I read your instructions on making cauliflower fritters too … another must make, I think! My grandchildren arrive for a visit soon, and I think they will make great testers! Wonderful! I’ve tagged this and will def give both the soup and the bread a try. I think cauliflower is one of the most versatile and underrated vegetables, that along with parsnip and beetroot. Thanks for posting.